It is a global industry, striving to change the future of finance. …And the future is now. At Kurtosys, we’ve set out to cover exactly what’s happening in the financial industry the world over, one country at a time. With so many places contributing to the advancement of our digital world, each deserves their own time in the spotlight. As PWC reports, as a whole, Europe’s fintech scene has grown 215% year-on-year, and most of its startups are from London and Switzerland. In fact, every 11th fintech startup is reported to be based in Switzerland’s Zug Valley – it’s no wonder that the country was ranked the 15th largest Global Financial Centre by Deloitte, and given a Global Innovation Index Score of 1, outlining it has maximum potential for fintech growth and innovation. Switzerland is a recognisable financial centre figuratively and literally, situated in the very heart of Central Europe. The cities of Zurich and Geneva have stepped up as the big hitters of the fintech space, with the former housing the research departments of tech mastodons Google and IBM and ranking 7th in the Global Financial Centres Index, and the latter hosting the global Fintech community at SIBOS in 2016 and ranking 13th. The real dark horse, however, is the aforementioned Zug Valley, nicknamed the Crypto Valley for its innovative focus on new storage solutions, encryption and digital currencies. Switzerland has always had a long-standing tradition of privacy and security, with a stable and supportive IT environment; the perfect environment for cryptocurrency to flourish. As it stands, cryptocurrencies are treated as foreign currency – this report outlines that no new laws need to be introduced to allow them. The future of digital payments looks set to take off from this very location, it seems. 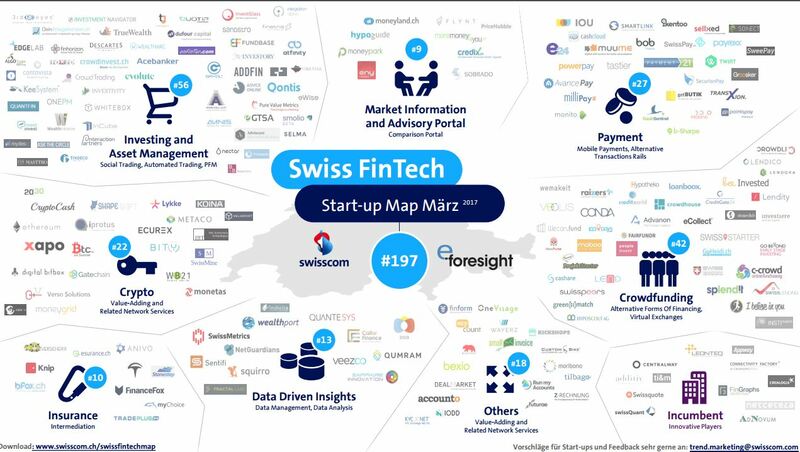 Additionally, as of June 2016, Switzerland is home to at least 185 fintech startups, and in 2014 CHF470m of venture capital was invested in startups, a 10% increase from 2013, and financial services contributed almost CHF81 billion in the same year, employing around 260,000 people. Over 100 fintechs are concentrated in the sectors of investment and asset management, financial portals, payments, crowdfunding and data management. With economic stability (the Swiss franc is a strong currency) and a germinating fintech scene – what’s the truth about Switzerland’s position as a fintech superpower? Unfortunately, it seems that all this potential is still at a nascent stage, and what follows are the reasons why. For one, the country has an infamously high cost of living with competitive tax rates. Of course, this makes the process of starting up and maintaining a business a particularly difficult endeavour. High salaries are required to attract talent to Switzerland, and it ranks “below the EU average shares in SMEs collaborating with others, community designs, and exports of knowledge-intensive services” according to a 2016 report by EY. Entrepreneurial activity amongst the youth (18-24 years old) is the lowest of all of Switzerland’s comparable countries at only 6.2%, even though the 35-44 age group has the highest in the same category. Even as the ‘third best economy’, Switzerland is very much in an early stage of development for the venture capital and incubator landscape, only raising around a third of London’s investment. It needs to focus on becoming a hub for senior entrepreneurs. US-backed Swiss banks (Pictet and HSBC Private Bank in Geneva) face penalties for tax misdeeds. Following on from such scandals as the Panama Papers investigation, financial regulators and prosecutors are wary of corruption and the possibility of billions being siphoned using Swiss banks. Switzerland’s central bank levied charges on Swiss franc deposits in 2016 and had negative interest rates, as new providers in insurance and pension funds have entered the market with cut-rate prices. But, one of the biggest Swiss financial institutions – Credit Suisse – is preparing to attract new investors to an IPO, headed by former investment banker Thomas Gottstein. If it succeeds, another universal bank will be established in Switzerland. Switzerland is one of the only 50 early adapters of an OECD-brokered automatic exchange or information (AEOI), enabling the shipping of client data and putting the country on a playing field globally whilst Swiss banks still wait for market access to the EU. Startups such as Contovista, Creditgate24 and Swisspay have found investment whilst traditional banking has sided with payment app Twint. However, most of Switzerland’s domestic efforts were renewed last year; mid-sized players with few or no foreign operations are in danger. Indeed, it seems banking in Switzerland faces many a financial hurdle. As Global Legal Insights notes, interest rates are low (and sometimes negative), and foreign banking groups have either closed their operations in Switzerland by liquidation or sale, or trying to seek AUM en masse through acquisition or merger. The country is, however, the global market leader in assets managed cross-border (offshore), with a global market share of 25%. The Swiss regulatory framework is based on a “silo-principle”, which means that financial institutions are regulated according to separate Swiss federal acts; banks primarily adhere to BankA and BankO, securities dealers to SESTA and SESTO, and fund/asset management companies to CISA and CISO. The Swiss National Bank (SNB) is the independent central bank responsible for “monetary policy and the overall stability of the financial system”. A fintech license granted by FINMA for institutions not in the lending business is restricted to the taking of up to CHF100m. Minimum capital should amount to 5% of accepted public funds and no less than CHF300,000. The Digital Finance Institute also notes that FINMA has introduced new initiatives to help Swiss Fintech: new rules on client onboarding (allowing online customer identification), a “less onorous licensing category” for financial innovators, and a license-exempt regime for startups. With regulatory changes, then, the Swiss fintech sector will be hoping to properly materialise. Glarner Kantonalbank, in January 2015, launched an investment platform for ETF investments starting from CHF5,000. Basellandschaftliche Kantonalbank has introduced a P2P crowdfunding platform called “miteinander erfolgreich”. The SIX Group (the operator of the Swiss financial centre infrastructure) has started the fintech incubator F10. Even the Swiss Post has launched its financial unit PostFinance, and made the smartphone application Twint. Certain conferences and events tailored to the acceleration of fintech include Finance2.0 (which held its first conference in October 2013, the largest annual fintech event), Meetups Zurich and Geneva, Fintech 2015 Boost Innovation and the Swiss Fintech Awards, and digitalswitzerland, an association dedicated to the strengthening of the Greater Zurich Area as a digital hub, which also runs the Kickstart Accelerator initiative, a zero-equity accelerator furthering the potential of promising international startups. btov Partners – A VC firm investing in digital and industrial tech companies, founded in 2000 with its HQ in St Gallen. So far, they have raised $257.83m in funds. Go Beyond – A Zurich-based VC firm investing in early-stage fintech companies, bringing together entrepreneurs and private accredited investors. It has already invested CHF17.6m in 60 companies, founded in 2011 by Brigitte Baumann and Bethann Kassman. Investiere – An online VC platform investing in Swiss startups which brings together private investors and SMEs. Verve Capital Partners has operated Investiere since 2010, merging traditional VC with e-finance and social media. Based in Zug and founded in 2007, it has invested CHF21m. LakeStar – Invests in early and growth stage tech companies, with a focus on Europe and the US but works worldwide. Past investments from them and their general partners include such giants as Spotify, Skype, AirBnB, Klarna and Facebook. It was founded in 2012 by Klaus Hommels with its HQ in Zurich and its funds raised so far are $398.59m. RedAlpine – European seed and early-stage venture investor, focusing on “highly scalable ICT and Health Tech models”. It was founded in Zurich in 2007 by Michael Sidler and Peter Neiderhauser and has raised $81.7m in funds. SICTIC (Swiss ICT Investor Club) – Invites all tech-driven, early-stage startups based in Switzerland to apply for funding from investors. Founded in 2014 and based in Zurich. NexusSquared – A Zurich-based business platform to help apply blockchain technology to different industries, partnering with institutions within finserv and more, helping both new ventures and established players. #28 – Xapo – Founded in 2012 by Wences Casares, Wensceslao Casares and Federico Murrone, Xapo is a bitcoin wallet and secure vault, which introduced the world’s first bitcoin debit card for transactions and ATM withdrawals. Named the “Fort Knox for Bitcoin” by the Wall Street Journal. #49 – Knip – Founded in Zurich in 2013 by Dennis Just (CEO) and Christina Kehl, it is a digital, secure insurance broker which uses its own app and web service for paperless insurance management. “Rising Star” – Anivo – With its HQ in Baar, Zug and founded in 2015 by Alexander Bojer and Werner Flatz, Anivo is an online health insurance comparison tool and offers insurance advice for both personal users and corporate customers. Bexio – Cloud-based business and accounting software to manage customers and invoices, founded in 2013 by Jeremias Meier (CEO), Marcel Lenz (Solution Architect) and Stefan Brunner (Product Owner), based in Zurich. InvestGlass – A robo-advisor, client and prospect management platform for the financial industry, founded in 2014 by Sebastian Thévenaz and Alexandre Gaillard with its HQ in Geneva. Monetas – A digital platform aiming to connect all to the global economy, boosting payments and trade services supplied by banks and financial institutions through mobile, founded in 2012 by Johann Gevers. Of course, that’s just scratching the surface of Swiss fintechs. To view a fairly hefty mind-map to highlight including many more, follow this link. Similarly, please watch this documentary film about Swiss fintech, made by Manuel Stagars, an economist and film maker with 15 years’ experience in startups. Entrepreneurs and experts in the field outline how their businesses started and the makeup of their teams (one only had one banking professional!). They truly show the Swiss passion for innovation. So there you have it. Switzerland’s sprawling and healthy fintech scene highlights its abundant potential, and with some tweaking to regulation could become the major competitor in the European fintech market. If you have any thoughts about Swiss fintech, let us know in the comments below, or you can tweet us. Check back soon for more instalments of The Fintech World Series!